Our Powerful Easy-to-Use Microsoft® Word & Outlook® addins are used by thousands of businesses around the world. Use our software today to save time, improve the quality of email communications and make your business more productive. Send Guard for Outlook is a collection of “guards” that check your emails before they are sent out to prevent users from accidentally sending emails with incomplete, incorrect or inappropriate information. These seemingly trivial mistakes can make your company look unprofessional, cause delays, waste valuable time and put your company at risk if confidential information is disclosed to the wrong people. Personalized email marketing can be a gold mine for your business. EmailMerge Pro for Outlook is the easiest way to send personalized holiday emails and invitations with Microsoft® Outlook®. EmailMerge Pro for Outlook is our mail merge Outlook add on, allowing you to generate large numbers of personalized emails using your contact list of customers and friends. This easy-to-learn, easy-to-use Outlook mail merge download has a helpful wizard interface that gets you up and running in minutes. 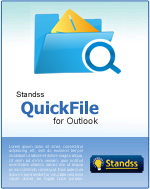 QuickFile helps you organize mail quicker and more sensibly. Your emails get filed away quickly and easily, and you can find them again later, quickly and easily. QuickFile outperforms the other mail organizers because it enables you to save incoming and outgoing emails into the right folders and subfolders with a simple click.